Operative vaginal delivery methods, which include forceps and vacuums, are sometimes used as an alternative to cesarean delivery during the second stage of labor. While they carry high success rates and allow mothers to avoid a c-section, they also come with risks that many parents are unwilling to take. According to the CDC, 3.3% of deliveries in the US in 2013 were performed using forceps or vacuum, with the use of forceps accounting for 0.59% of all births and vacuum accounting for 2.72% of all births. Operative vaginal deliveries are generally indicated for a prolonged second stage of labor or non-reassuring fetal status. A prolonged second stage of labor is defined by ACOG as more than three hours of pushing for nulliparous women with an epidural and two hours of pushing for nulliparous women without an epidural. For multiparous women, a prolonged second stage is no progress after two hours of pushing with an epidural and one hour without one. Forceps or vacuum can often lead to delivery faster than a crash c-section if the baby is low in the pelvis and suffers a heart rate deceleration or another complication that requires immediate delivery. After you are counseled on the risks and benefits of an operative vaginal delivery and elect to proceed, your nurse or doctor will use a catheter to drain your bladder to reduce the risk of bladder injury. Many providers will only attempt an operative vaginal delivery in patients with an epidural in place, so at this time your epidural will be re-dosed. If you do not have an epidural and your provider is still comfortable proceeding, you’ll likely receive a local block. You’ll be positioned with your feet in stirrups and will be appropriately draped for the procedure. 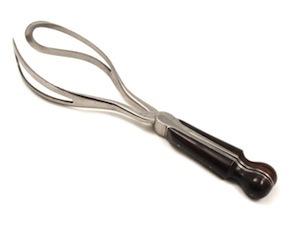 Forceps are metal and shaped like large salad tongs. They are applied to the each side of the baby’s head with the tips of the blades lying over the cheeks. During a contraction, the handles of the forceps are grasped together and the baby is pulled down and out of the birth canal. In addition to being used for a prolonged second stage of labor or non-reassuring fetal status, forceps can sometimes be used to rotate a baby’s head into a better position for vaginal delivery in the hands of an extremely experienced and skilled obstetrician. While forceps can be a very effective tool when used by an trained provider, they are a dying art in most US hospitals, with fewer and fewer physicians being taught how to safely use them. A vacuum is most often a soft, flexible cup that is applied to the baby’s head while in the birth canal. The cup is connected to a small, manual handheld suction device that either the obstetrician or an assistant will generate suction for. You will push during a contraction while the doctor gently pulls on the vacuum to help guide the baby out. A vacuum is also sometimes used during cesarean deliveries to avoid extension of the uterine incision and facilitate delivery of a floating head. Both forceps and vacuums can be very successful tools to help avoid a cesarean delivery, however they each come with risks. Forceps carry the risk of facial cuts and bruises to the baby, as well the much rarer risks of facial nerve injury and intracranial hemorrhage. Vacuums carry the risk of scalp markings, cephalohematoma, and very rarely, intracranial hemorrhage. Additionally, they both carry a higher rate of maternal hematomas and third and fourth degree tears which can lead to pelvic floor injury. Only obstetricians are trained in performing forceps or vacuum deliveries, so if you are being cared for by a Certified Nurse Midwife or family practitioner, his or her backup physician would be consulted to perform the delivery. While operative vaginal deliveries carry a high success rate, not all women are comfortable with attempting one due to the risks involved. In most cases, a cesarean section can be performed instead of an operative vaginal delivery. It may be worth asking your care provider if they are experienced in using forceps or vacuums and if so, if they routinely offer it as an option. American College of Obstetricians and Gynecologists. Operative vaginal delivery. ACOG Practice Bulletin number 17, American College of Obstetricians and Gynecologists, Washington, DC 2000.